This is an are of an AR15 that just begs to be upgraded. 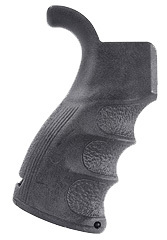 The stock pistol grip of an ar15 type rifle usually leaves allot to be desired. 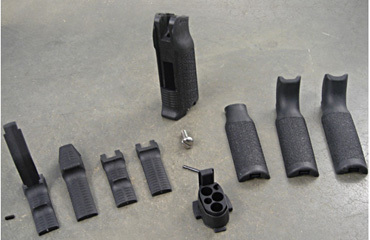 Replacing your pistol grip is a pretty inexpensive upgrade that will yield great returns to a shooter. 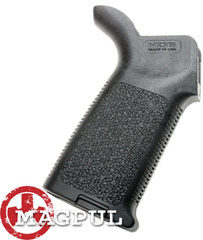 The cost for a decent grip starts at about $20 with the better units like the Magpul's in the $35 range. At the top end of the scale $45-$70 will be the tactical/target grips with an adjustable rest for your palm at the bottom of the grip. 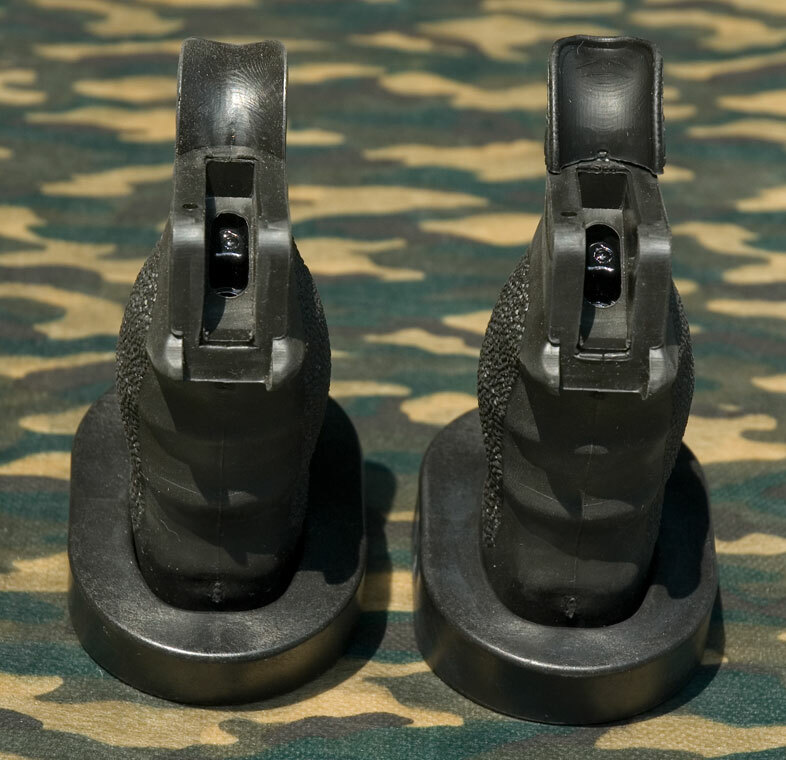 Utilizing a quality pistol grip will aid in accuracy by improving your grip and finger placement for proper trigger contact and subsequent trigger pull. Additionally some grips offer an added benefit of storage in the empty space of the grip. If your not sure what to get and don't have the option to try out the various pistol grips available stick with Magpul and you cant go wrong. 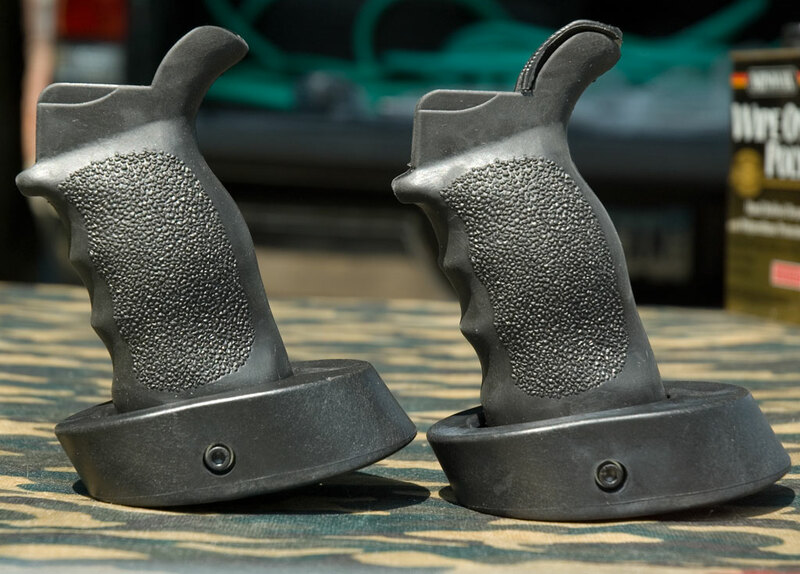 Falcon's Tactical Deluxe grips offer an ergonomic styling featuring palm swells and an extension of the back of the grip to fill the web of the hand which sets the hand further to the rear for better trigger control. Click the images below to view them full sized. 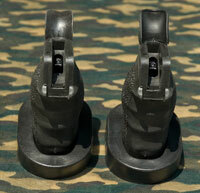 The is a drop in replacement for the pistol grip on the M16/M4/AR15 series of rifles. t features removable and replaceable front and rear panels for a custom fit over multiple hand sizes. Grip features improved ergonomics and positive anti-slip texture on both sides and rear back-strap. Features a removable inner core that allows for storage (3 round plug included). 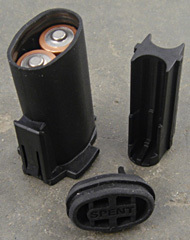 Custom storage of batteries (waterproof) or bolt/firing pin is available with optional cores. Full Kit includes 3 size back-straps (S,M,L), 4 front-straps including integrated enhanced trigger guard, 3 round core plug, and installation hardware. Will not work with AR10/SR25 style rifles without modification. Further customize your MIAD grip to suit your specific needs with one of these interchangeable internal storage compartments. No tools or permanent alternations required. 123 Battery Core holds two, spare CR123 batteries in a sealed, waterproof compartment, keeping them ready for quick deployment if the batteries in your laser, light, or red dot sight fail. AA/AAA Battery Core provides waterproof, rattle-free storage of two AA batteries or, with the included internal spacer installed, two AAA batteries. Reversible rubber cap has “SPENT” stamped on one side, so you always know the status of the batteries in the compartment. Bolt & Firing Pin Core securely holds one, standard AR-15/M16 bolt, plus a spare firing pin, should your gun suffer a failure in competition or during a critical operation. Magpul Original Equipment (MOE) pistol grip gives the shooter a more comfortable, secure grasp than standard, A2-style grip for better trigger control and recoil management with less fatigue. Improves weapon handling during precisely aimed shots as well as sustained semi- or full-auto fire. Rigid, fully supported one-piece construction from reinforced, high-impact polymer, with crackle texture on the sides and deep horizontal grooves on frontstrap and backstrap to keep your hand firmly in place, even when wet. Curved beavertail fills the grip-to-receiver junction to help you maintain a comfortable hold and protect the web of you hand during sustained firing. Removable grip cap provides access to a roomy internal storage compartment for spare batteries, cleaning supplies, small bottle of oil, or even a spare bolt. 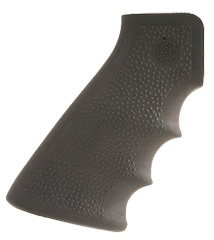 Compatible with Magpul MIAD Grip Cores and Enhanced Aluminum Trigger guard, available separately. Drop-in installation in minutes with included mounting hardware and instructions. Available in black and two popular tactical colors, Dark Earth and Foliage Green. Strong, fiberglass insert fits solidly against the frame, resists wear, won’t loosen. Orthopedic design with palm swells and finger grooves reduces shock, increases shooting comfort; maintains a stock appearance. 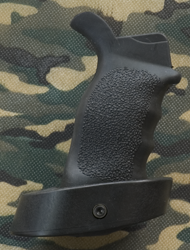 Drop-in replacement for factory pistol grip has sculpted, ergonomic contours designed to provide an exceptionally comfortable, secure grip that minimizes hand fatigue, enhances trigger control, and improves weapon handling during sustained rapid fire. Also helps reduce hand fatigue during long periods in the ready position. A wide, hand-filling palm swell and gently curved finger grooves provide plenty of support, while molded-in stippling and vertical grooves on the backstrap help you maintain a firm grip with wet hands. Sweeping, integral beavertail allows a high hand position for outstanding recoil control. Positive-locking trapdoor in the bottom opens to reveal a roomy internal storage compartment large enough for two AA or CR123 batteries, spare ammo, cleaning supplies, or small parts. Molded from rigid, nearly indestructible reinforced polymer composite.